Ultiflame, Puraflame, Electriflame... What Is The Difference? Combining style with innovation, the Celsi range of electric fires and heaters is the ultimate in high technology. Celsi encoroprates three completely different ranges of electric fires. The Celsi Puraflame range features LCD technology and gives you some the most convincing real fire effect available today. A Celsi Puraflame electric heater is extremely versatile and creates a breathtaking feature virtually anywhere in your home, from your lounge to your bedroom. Celsi Puraflame is also the only electric fire to give you the astonishing look and sound of a real fire, combined with exceptional functionality. At the touch of a button you can control your roomtemperature, flame picture, flame speed, volume and brightness. Celsi Puraflame is not just a fireplace. It’s an experience. also benefits from a low power flame effect system which consumes 90% less energy than conventional electric fires when on the flame only setting. The heat output temperature can be adjusted between 0.75kW and 1.5kW and the brightness of the fuel bed glow can be customised too. Every model in this range can be operated by push buttons discretely hidden beneath the canopy of the fire or via an ergonomically designed remote control handset. With an overall product depth of just 3” this fire can be fitted against a flat wall with any 3” rebated surround with no requirement for an additional spacer. The Celsi Electriflame is the latest flame effect from Celsi and features LED technology to create a unique flame effect, available in a number of different models, ranging from hang on the wall electric fires to inset electric fires. The Electriflame effect also allows 3 different brightness settings and a totally silent flame effect operation. With remote control as standard and concealed manual controls these fires can be fitted against a flat wall with any 3” rebated surround with no requirement for an additional spacer. The Ekol 'Crystal' range has been designed by Cleanburn Technology Experts to provide the ultimate Cleanburning Smokeless Woodburning Stoves suitable for use in all of the UKs towns and cities designated smokeless zones, including the strictly controlled Central London areas. The Clean-Burn result of a highly advanced combustion chamber means your chimney will show a clear vapour escaping instead of black smoke associated with regular stoves and fireplaces. 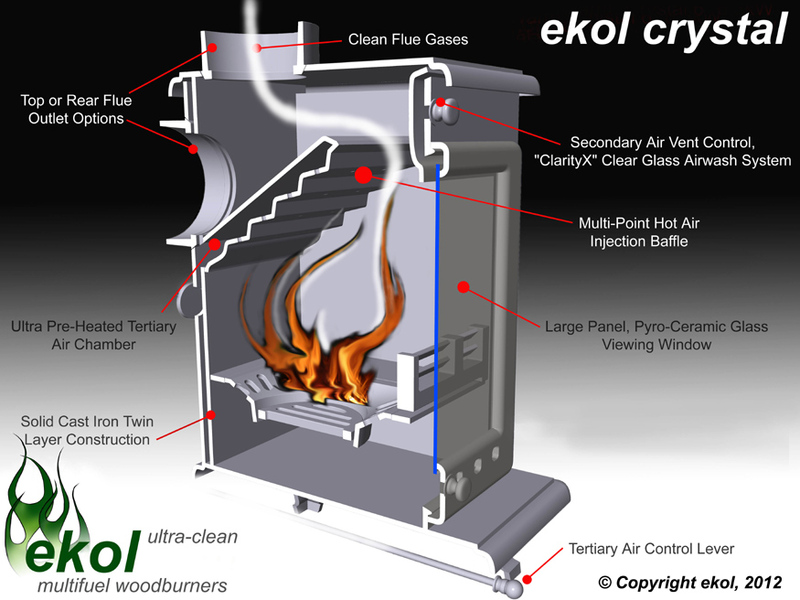 Switching your existing fireplace or stove to the Ultra Cleanburning effects of the Ekol Crystal can reduce asthma related symptoms and other respiratory problems, both inside the house and for those in the local area. Officially recognised by DEFRA, making it legal to burn wood in any Smoke Control Zone area of the UK, the Ekol Crystal range showed through rigorous testing that their smoke particle emissions are as little as just one third of the amount allowed to pass the stringent DEFRA approval. Ekol Stoves have developed a technology whereby wood can now be burned so efficiently and cleanly that it can legally over-ride this legislation - Once again people in these areas are able to burn wood legally, using an Ekol Stove. Ekol stoves are officially a 'DEFRA Exempted Appliance'. Most of the UKs population lives within Smokeless Zones so will require a DEFRA approved stove to legally burn wood. Firstly you will notice the glass on your stove is incredibly clean even compared to other modern stoves with airwash systems - this is simply because there is no longer the same amount of smoke and tar present. Also, the pre-heated Tertiary air System ensures the gases in the stove are not allowed to solidify. Secondly, the "Dancing Flame" effect created by the Hot Air Injection System will have you mesmerised watching the fire burn. Less Maintenance - Because the level of combustion is radically increased, much less ash is produced so the whole stove requires less cleaning. Also, the huge reduction of smoke and solid particles from the chimney mean less chimney sweeping. Ease of use - Woodburning with Ekol Cleanburn Technology has never been easier. With three sets of Air Supply Vents giving you maximum control, the firebox Airsupply is quickly brought up to temperature allowing the stove to rapidly get to its most efficient operating temperature making it easy to get going and to maintain and refuel the fire. We are probably all familiar with a traditional brick built chimney which would have been a requirement in every period property as we would have relied upon them to provide warmth from the open fire. But with the switch to gas and central heating chimneys soon started to dwindle in modern properties and the traditional inefficient open fire made way for the new high efficient gas fire. As fashions change and we progress through the decades, new things become old and old things become new we have seen a resurgence of the open fire. Stoves have been a part of many home owners lives for a number of years, in fact the first stove was invented in 1741. But the stove largely remained in the country side where there were no smoke control laws imposed. Stoves were introduced into the more mainstream market as the demand for open fires increased and with the demand for more efficiency to meet those attained from gas fires. One of the problems being though that over the last 60 years the majority of new homes were rarely built with a traditional chimney, as they were not needed for new gas fires. Fortunately though for anybody who has a modern built home without a chimney there are a number of chimney systems available to give virtually everybody the chance to enjoy the magic of a woodburning fire. The most popular of the systems being a twin wall flue system. This is stainless steel solid pipe which is enclosed within another pipe and then insulated. This can be installed just about anywhere and is either taken through the wall and up the side of the house or through the inside of the house. For those who don’t like the stainless steel appearance on the outside of the house then it may be possible for the flue to be supplied in virtually any colour from terracota to teal, but normally just in black. If you don’t have a chimney in your home but would love to have a woodburner installed just contact your local HETAS engineer and they can arrange a survey to run through different options and the best one for you.